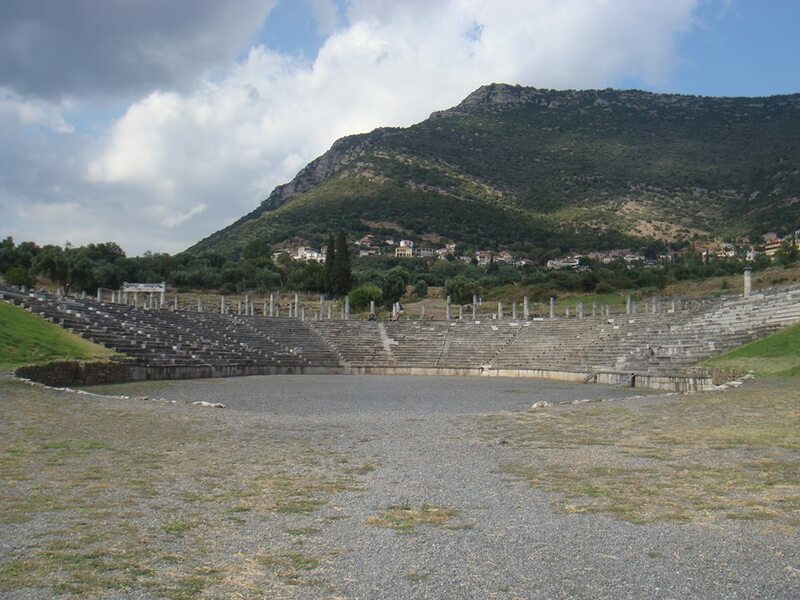 Messene was founded in 369 BC by the Theban general Epaminondas following his victory at Leuktra. It was part of the strategic barrier against Sparta, the southernmost of a chain of walled cities including Megalopolis and Argos; these 3 strongholds had to confine Sparta to its own borders once and for all. In the previous centuries the Spartans had given the Messenians a hard time. Since they were busy with becoming good warriors all the time, they needed other people (servants!) to provide them with their daily bread. In the 8th century BC, they crossed the Taygetos Mountains and invaded the fertile area of Messenia. The people who were living there became slaves and a lot of them fled and settled in other areas all around the Mediterranean. When Sparta was finally defeated in 369 BC, the Theban general Epaminondas invited the Messenians, who had been exiled from the area centuries before, to come back and build the city of dreams! The ruins might not draw many tourists although it is a remarkable. The charming town of Mavromati sits above the ruins of ancient Messene and provides an exceptional view of the valley all the way to the coast. Systematical excavations of the site began only 25 years ago and continue up to this day. You will enter this city through one of the original city gates just like ancient travellers did 2300 years ago. The 9 km long city wall is among the best preserved city walls all over Greece. At some points they reach a height of 7 meters. Once in the archaeological site, take your time to admire the theatre. After 1700 years of silence, the theatre was reopened last summer with a beautiful opera gala. When the archaeologist first started the excavations, they were discouraged. The theatre was practically nonexistent, the only thing left were some retaining walls. The restoration of the theatre lasted more than 20 years. The archaeologists managed to reunite the scattered pieces and put more than 2000 seats into place. Works at the cavea have not been completed yet. Now it has been restored up to its 15th row. After its completion the capacity is estimated to reach 5000 seats which is half the capacity it had in antiquity. Other places of interest are the agora, (the town’s large market area), the town’s central shrine and the very impressive stadium and gymnasium which form one architectural unit, an architectural rarity. From here you will have a breathtaking view over the Messenian plain. Tip: After your visit of the site, have lunch in the tavern just opposite the spring in the charming town of Mavromati .It is situated above the ruins of Ancient Messene and provides an exceptional view of the valley all the way to the coast.